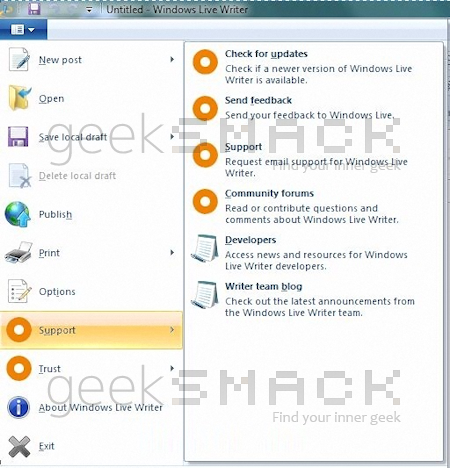 Earlier this month Neowin revealed Microsoft's upcoming release of Windows Live Messenger 2010 (Part of Wave 4). This week the guys over at Geeksmack have received a few screenshots of Windows Live Mail and Windows Live Photo Gallery. The screenshots are of build 15.0.2403.826, which should be noted is a very early version of Wave 4 and it is expected that features will change before the actual beta early next year.Not much can be said about the screenshots except that both Windows Live Photo Gallery and Windows Live Mail both now feature a Ribbon UI.In an interesting move, it appears that Windows Live writer will now sport a new menu similar to Microsoft Office. The orange icons are currently a placeholder, and will not be in the final build. Not much is known about the current internal builds shown above, but as far as we can tell it appears that no new features have been added at this point. The one thing that I would love to see Microsoft change about the ribbon interface is to allow it to be placed on the left or the right rather than the top. The industry is moving to a 16:9 (or wider) format where screens are tight on vertical space with horizontal space to spare.